A little Christmas fun designing with paper, frames, and strip dies. 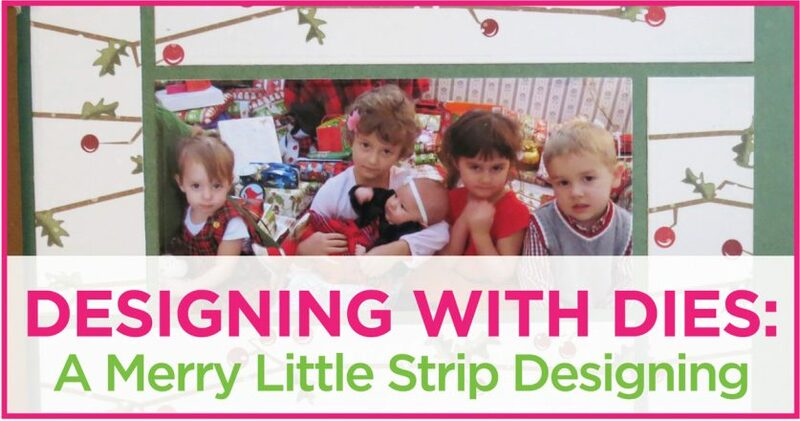 Designing with Dies is featuring some of our Mosaic Moments Strip Dies. We have three strip dies 2.125”x 1”, 3.25”x 1”, and 5.5”x 1” plus two strip frames, a 3×4, and a 4×6. 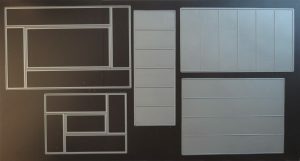 This layout will use both strip frames and the 3.25”x1”. Meadow Green from the Trailblazer Collection provides a beautiful, lush color base to work with PhotoPlay’s Holly Jolly in the Holiday Cheer Collection. 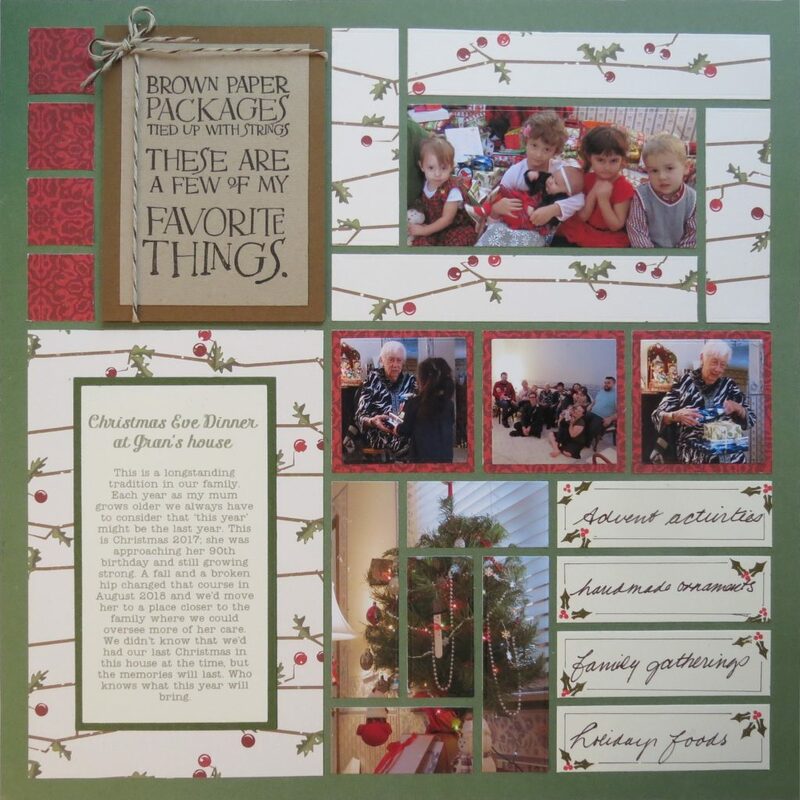 I’ve included green, brown and tan cardstock for a few of the other elements on the page. 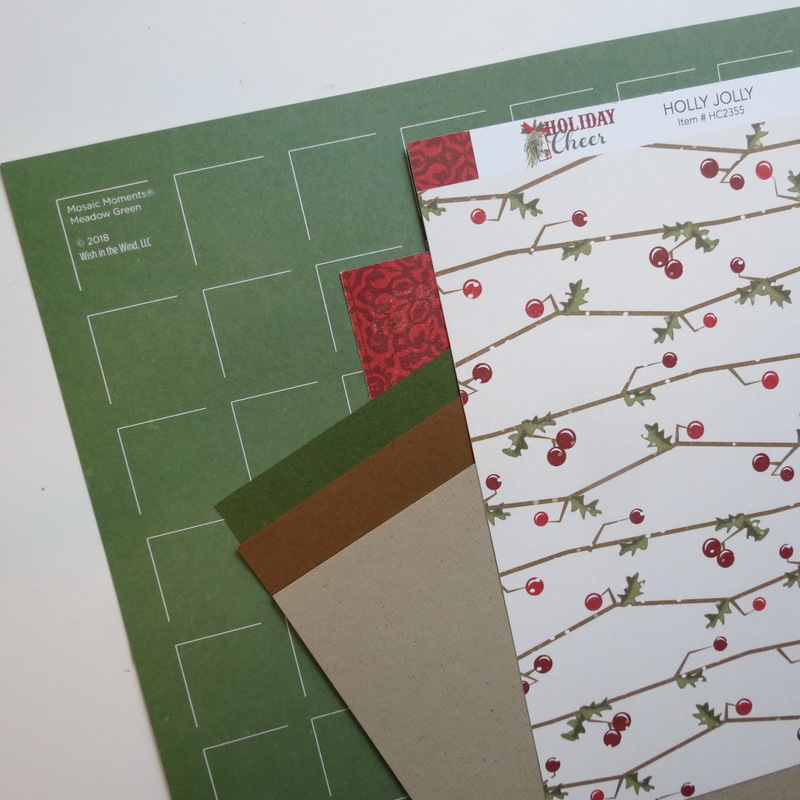 The Holly Jolly is a double-sided page and the red pattern on the reverse side works nicely as mats for the 2×2 spots and the 1” squares along the side. 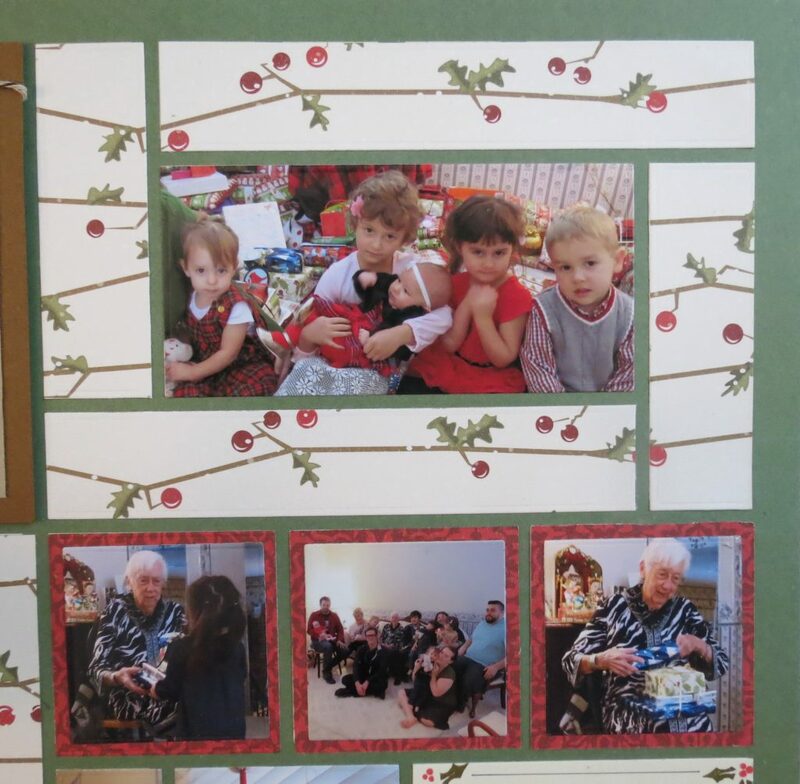 I’ve also used the patterned paper for the large 4×6 strip frame to create a festive border for a photo of the grandkids. I also used the die to get that section of the photo cut to fit the spot. Another section of patterned paper is cut to fit the 4×6 portion of the pattern with Die Set B. 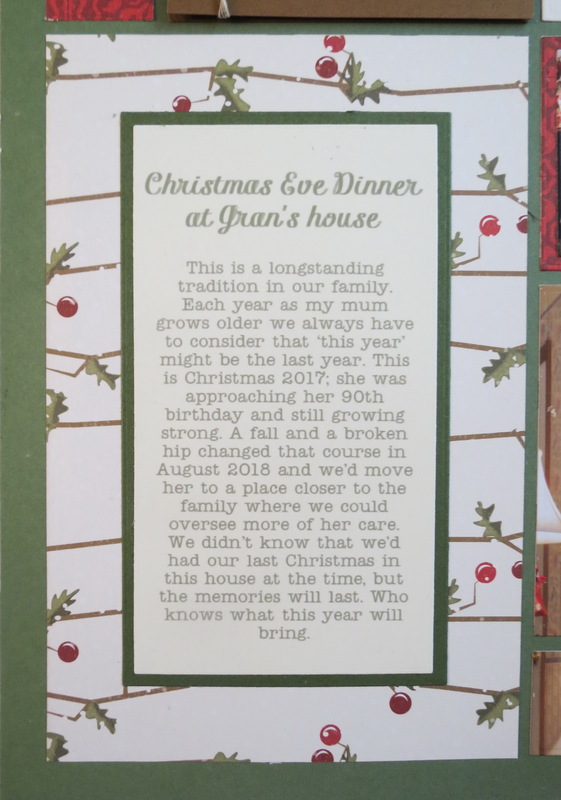 The journaling was printed on a 4×6 card and cut to size also with Die Set B. The narrow green mat was cut using the Layering Dies from die set BL. This layering of the green and cardstock mimics the other 4×6 spot cut using the 4×6 Strip Frame. It has the appearance at a glance of the same 1/8” border. With the smaller 3×4 Frame Die a picture of the small tree with handmade ornaments is cut. 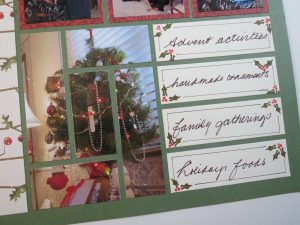 My ‘list’ of some of my favorite things was created with the 3.25”x1” strip die. I’ve only used 4 of the 6 strips, and hand wrote and stamped the holly and berries. I added a rough fine line border around each section. 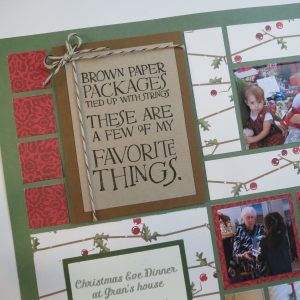 My word art is created with a stamp set designed by Nichole Heady at Papertrey Ink, Favorite Things Stamp Set. I’ve stamped on tan mounted on brown. I doubled the brown and added a layer of foam mounting tape, this gave me a spot to hide the twine that I wrapped my ‘package’ with and then added a bow to finish it off. Three small 2×2 photos are cut using the AL Die Set and their mats with Die Set A. And these are some of my favorite things at Christmas. What are yours? Make a list or frame it up!